How is the farm distributed? We have a breeding barn for 720 pigs, where we keep the sows for between 40 and 45 days, and then they go to confirmed farrowing, where we work with auto-capture cages until they are between 107 and 109 days. Once this cycle is completed, we move the sows to farrowing pens. Specifically, we have 21 sheds with a total of 396 farrowing pens, where they are kept after delivery for about 22 or 23 days of lactation, which is when we wean the piglets. We also have 4 weaning rooms, where we have the nurse sows. Finally, the farm has a growing-finishing barn for 700 pigs, which is where we house the farm's future mothers, a quarantine area, a complete and comfortable area for workers, a warehouse, a workshop, a water sanitation room and a heating room, which works with biomass. Who works on the farm and how is the work divided? We are a total of 7 people: a secretary who handles all the administrative work, 4 people in the farrowing barns, two of them in charge of deliveries and the other two to control the feeding of animals and processing of piglets and, finally, two more people in the breeding-gestation area. The dispensers, the Dositronic electronic feed supply system, farrowing and weaning slats, the heating plates, dishes for newborns, the VRH-3 valve, fences, the TR-5 hopper, the Grow Feeder hopper, the feed distribution system, etc. Why did you decide to work with Rotecna products? Throughout my entire life as a farmer I've always worked with Rotecna products. All their products offer very good results for farming. 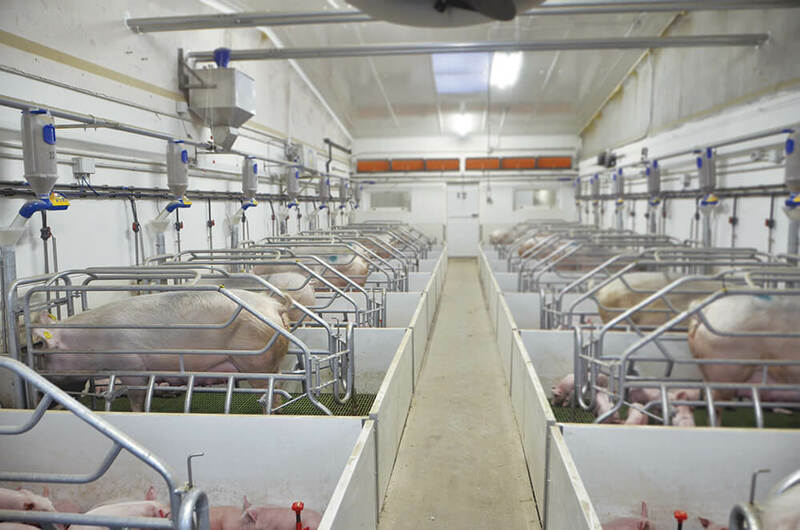 In farrowing, you have decided to work with the new Dositronic integrated electronic feeding system: why? Because of its advantages for managing feed in farrowing, as it helps us to increase our sows' feed intake during lactation, with the benefits that this implies, and we can individually control the amount that each animal is eating. What are the main benefits that you would highlight about its use? There are many. In terms of consumption, you can see how much an animal has eaten at any time, give it more or less feed depending on your needs, whether it is winter or summer, make sure that they can eat at night... We use the Dositronic ad libitum, so once we have determined the curve for each sow, they can eat whenever they want and eat whatever amount they want in each ration. We now have very good feed consumption, the sows are weaning 15.7 piglets of a weight of 5.4 kg (yearly average), and their bodies are in fine condition to breed again. It is also very important to note that with the Dositronic there is no wastage of food, the pans are always clean, and this, in turn, reduces the workload for the staff, as they don't have to spend any time emptying the pans. Finally, I should mention highlight the security and peace of mind that this system brings us, as you don't even have to be on the farm to feed the sows. How many feeding curves do you work with? On day 0, which is when the sows enter the farrowing pens for delivery, we set the feeding curve to a maximum of three kilos; on the day of farrowing the sow can only eat, if she wants to, 1 kilo and, after the second day, she goes back to having 3 kilos. From that day, the daily ration increases by 1 kilogram a day until a maximum consumption of 13 kilos at the end of lactation. The advantage of this system is that, if you notice that a pig is asking for more food, you can increase their ration, or lower it in the opposite case. In the day-to-day, how do you organize your work to bring out the best in the Dositronic? The first thing that I do every morning is walk around the barns to quickly check what feed has been consumed using the information that I get from the coloured lights on the Dositronic. Then I go to the computer and use the program for a more detailed review of the sows that have not eaten, I note down what pens they are in and then I go straight there to see what's happened. The job takes 20 minutes, it is very fast. With the Dositronic you certainly save a lot of time. Do you think the pushbutton panel is an advantage? Yes. In the morning, when I check the rooms, the LED lights on the Dositronic quickly give me a lot of information about the sows' consumption, and I can use the panel to increase or decrease the feed level depending on what each sow is consuming. And on the day of delivery we press the button on the panel to start lactation, and on weaning day we press the weaning button, and turn off the system. How do you use Dosipocket? We use it a lot: to register sows in the system when they enter farrowing, to record the animals' movements, to increase and decrease the sows' feed level if necessary... Both the Dosipocket as the pushbutton panel, in terms of handling, are certainly very easy and intuitive systems to use, so we find them very helpful and useful. What does being able to have all the computer data on the sows' consumption behaviour mean? It is a very useful tool that makes everyday work on the farm much easier. If a sow does not eat, it is very easy to use the program to locate her and go to find out what's happened. In a conventional system, if you want to have this information, you have to go barn by barn and pen by pen , and even so you will never get so much data on the animals' feeding habits as you can get with Dositronic. With this electronic system it is impossible for the animal to go for more than a day without eating, something that can happen with other systems. Have you noticed improvements in terms of sow and litter productivity? Yes, without a doubt. With respect to other systems that I work with, there are many improvements, especially in terms of the weight of weaned piglets. On farms with an average of 15.7 piglets like ours, other systems normally achieve a weight of about 5 kilos at weaning. But with the Dositronic, our sows wean piglets of an annual average of 5.4 kg, and in winter they can weigh 5.8-5.9 kg. This is one of the great advantages of the Dositronic, as well as the fact that the system encourages the sows to eat: if a sow eats, the noise of the falling feed stimulates the other sows to get up to hit the sensor and to get their ration of food too. Finally, with the Dositronic the sows' well-being has improved, they adapt to the system quickly and appear to be calmer, and that helps to boost productivity. In terms of health, what are your main concerns? Keeping the farm healthy, so we are very careful with our handling and don't allow anyone from outside of the operation to enter. What biosecurity measures do you adopt to reduce the risk of catching diseases? Entrance by outsiders on the premises is highly restricted and visits can only be scheduled for Mondays, the same as for trucks. And as for internal staff, they take a shower both when entering and when leaving the premises, and they know that once they are inside they cannot leave during the workday. The farm is managed from inside, so the staff have to be inside too. In exceptional cases there are boots for when leaving. As internal biosecurity measures, in addition to the shower area, we differentiate very clearly between the dirty area and the clean area. Personal items cannot be brought onto the farm, and there is a footbath at the entrance to each of the farrowing barns... On biosecurity issues, we are very demanding and all our staff are aware of its importance. Finally, what future challenges does the farm face? In terms of production, for this farm, my goals are always high, because I like to keep improving and to deal with challenges. In this sense, if we now have 38 weaned piglets per sow and year, on the basis of this figure and with the genetics that are coming in, we believe that we could reach 40-42 piglets/sow/year. Also, in the medium term we have planned an expansion of the farm that will involve doubling the number of sows from 2,000 to 3,800 by the end of 2019. The growing-finishing work will be done first, as the aim for the business is for us to repopulate the farm ourselves.